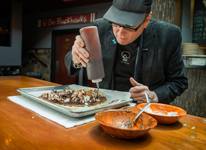 July 4, 2014 (Chicago IL) Legendary guitarist Rick Nielsen of Cheap Trick may be well known to millions of fans around the world as an iconic rock star, but they probably didn’t know something else – he can cook too! As part of his upcoming Artist Chapter of “Rockstar Recipes” iBook for iPads, Nielsen was filmed making two dishes at his Piece Brewery and Pizzeria in Chicago: Chocolate Pizza, plus a unique new creation called “Rick’s Signature Pizza” – a fun dish featuring his famous caricature signature “drawn” with spray cheese. The “Signature Pizza” video was produced as a buzz-building YouTube promotional piece, but it is only the “appetizer” to the “entrée”: The upcoming “Rockstar Recipes” iBook for iPads. Nielsen, a world-class guitar collector and avid gadget lover, is also a longtime Apple/Mac user who was also involved with developing Quicktime VR with Apple. PIECE BREWERY AND PIZZERIA. The award-winning restaurant and microbrewery was launched 14 years ago in Chicago’s Wicker Park/Bucktown neighborhood, and continues to thrive while a myriad of other trendy eateries and bars have come & gone. Prior to launching Piece, Jacobs and family owned Jacobs Brothers Bagels, a multi-unit chain that was sold to BAB Systems in 1999. His newest venture is Brobagel, located next door to Piece, scheduled to open in July 2014. Jacobs purchased the building holding Piece in 2012. In addition to “Rockstar Recipes,” Rock & Roll Kitchen® Films is supporting the “Induct Cheap Trick” campaign (Cheap Trick is not yet in the Rock & Roll Hall Of Fame). RRK Films will be endorsing the cause by producing assorted content including video and Twitter’s Vines, featuring “name” musicians endorsing the campaign. 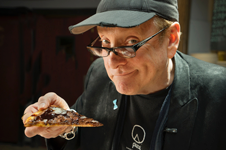 For those fans of cooking, music or Rick Nielsen who wish to get updates on “Rockstar Recipes”: Twitter.com/RockerRecipes or RockerRecipes.com. For more info on Piece Restaurant: PieceChicago.com, Twitter.com/PieceChicago. For more info on Cheap Trick: CheapTrick.com, Twitter.com/CheapTrick.